I’ve found that one answer to this question is the country’s organizing sailing body, Yachting New Zealand’s, Have a Go. The other week, the Have a Go program came to my area, and I gave the Yachting New Zealand coach Simon a hand. This program is centered on getting the country’s youth into trying sailing by having kids take a day off school (who doesn’t love skipping school?) to come down and give sailing a go. Have a Go was started and is able to continue through its sponsors. With Team New Zealand starting the initiative, the Lion Foundation joined to accelerate the program. Volvo also got involved by giving each coach a brand new car to pull the mobile trailer full of boats and gear from place to place. The other major sponsors are Zhik who supply the wet-suits and life jackets for sailors, Doyle Sails, and a NZ marine supply company called Burnsco, who supply spray tops. Through these sponsors and with the help of many others and donations, the Have a Go program cost can remain low. The cost per sailor for a full days program is less than $20 US. A staggeringly cheap amount for a day on the water of sailing instruction. Volvo Sailing… Have a Go! 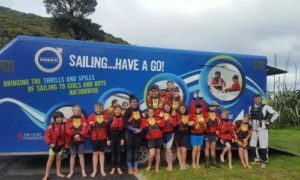 is Yachting New Zealand’s initiative to get children into sailing. 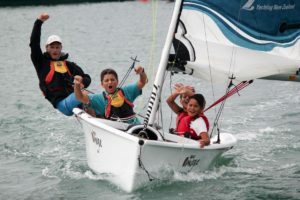 Offered to schools throughout the country in term four and one, it is designed to give primary and intermediate school students the opportunity to try sailing in a safe and well-managed environment. The aim of a Sailing…Have a Go! day is to provide kids with a fun, safe day on the water, with the hope that it captures the child’s imagination and they want to learn to sail. Host clubs are encouraged to use this opportunity to promote their learn to sail programme and club activities. With a focus on water safety and building confidence in and around the water, kids are taught the importance of wearing adequate clothing and correctly-fitted life jackets, rigging, parts of the boat and the basic ideas behind how to make a boat sail. All this education is disguised by fun activities, capsizing and often a sneaky water fight! Yachting New Zealand have three trailers that travel the country, complete with six Optimists, one Weta trimaran, two Topper Taz and a RIB. They also provide all the gear, including wetsuits and lifejackets. All schools need to do is show up to their local sailing club and go sailing. Transport of the participants to and from the venue. Providing at least one teacher or parent to be present during the course of the programme. They are welcome to come out on the water and have a go as well. Ensuring all students have parent/guardian consent forms (provided by Yachting New Zealand) on the day and are able to swim 50m with a buoyancy aid. Sailing is a sport that allows everybody, regardless of ability or disability, to take part on a level playing field and the Volvo Sailing…Have a Go! programme is easily adaptable to ensure all students can participate and enjoy with their peers. The Weta trimaran has proved to be very versatile and safe in a variety of conditions. It is fantastic for children who are initially nervous about sailing, building their confidence by going out with an instructor and other children. It can be easily modified for people with a physical disability to take part in the sport alongside their peers. Our coaches have all completed the inclusive coaching module, training stemmed from best practice of the Halberg Disability Sport Foundation. This training enables our instructors to be confident, knowledgeable and creative in adapting the programme to suit children with a disability – and nobody is left behind watching. The Volvo Sailing…Have a Go! programme began in 2006 with one trailer. The Team New Zealand 2000 trust provided the original funding to get the programme started and the Lion Foundation continued to help as the programme evolved from one trailer to two and, in 2009, three trailers. 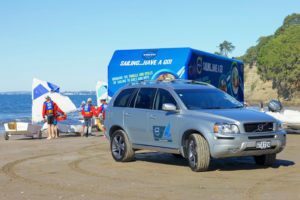 In 2013, Volvo Cars New Zealand came on board as the naming rights sponsor in support of youth sailing. Volvo Sailing…Have a Go! has taken more than 40,000 people sailing. 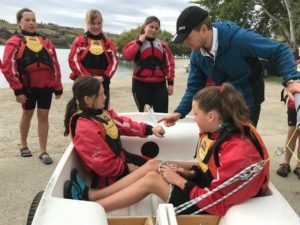 Have a Go is a breakthrough initiative and gets so many young people introduced to sailing who otherwise might never have. The goal is to get the interested students from Have a Go involved with their local sailing programs. Many of the students who came down for the Have a Go course in my area have decided they would like to join my clubs next Learn to Sail courses. This program run by Yachting New Zealand is unlike anything in the states or provided by US Sailing. If a country the size of New Zealand can successfully run an initiative like Have a Go, a much larger country like the US, who has tremendous amounts of potential sponsorship funds should be able to put something similar in place to involve potential sailors at a young age and at a cost affordable to them.